Congratulations to two EAC members who have designs featured in magazines. 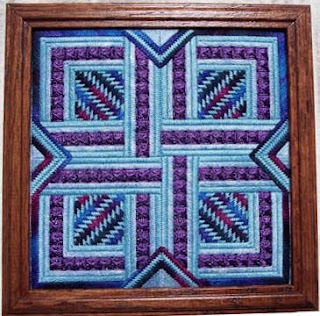 Jenny Wolter, a member from Calgary, Alberta, has this design in the current issue of American Needlepoint Now. Way to go, ladies! Can you imagine going into a book store and seeing your needlework in a magazine? I'd want to tell everybody in the store! As I mention sharing, I'd like to share with you one of my favourite stitching blogs: www.playswithneedles.blogspot.com Susan Elliot was recently in Stitch Magazine, and creates incredible pieces. 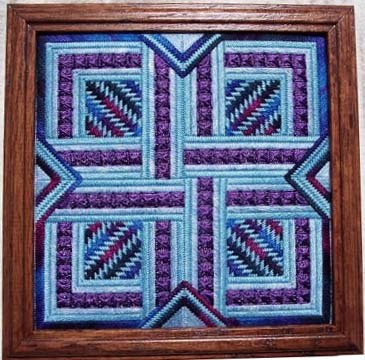 Check out her crazy quilting blogs; I'm sure you'll become a follower. Congratulations Jennie & Kim! The recognition is well deserved - beautiful designs!